The Station, a roadside stop in the Icelandic countryside, is a conjoined restaurant, drive-through, convenience store and gas station. Icelandic culture is in many ways shaped by American influences due to the 65-year long presence of an American army base in the country. 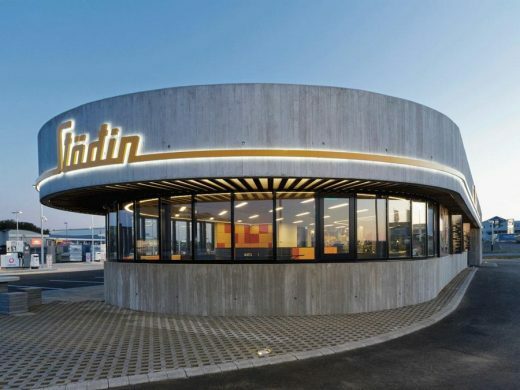 The Station addresses this cultural relationship by incorporating architectural elements from the American diner that contrast the traditional Icelandic building method of in situ cast concrete. The exposed concrete of the exterior bestows the diner with a permanence unknown by its American counterparts creating a friction between its streamlined aesthetics and the rustic materiality’s gravity. An elongated bar-desk transforms into seating arrangements and characterizes the semicircular restaurant, which offers generous panoramic views of the scenic fjord Borgarfjordur while the curvilinear form allows for a smooth circulation of cars outside. Interior walls are either white painted drywalls or in fare faced concrete. Ceilings are either suspended or in fare faced concrete. Floors are polished and lacquered concrete or laid with recyclable linoleum. All main interior elements such as the elongated bar, chairs, diner-booths and the suspended lights in the restaurant are especially designed for the building and locally produced in Iceland. The application of Icelandic building methods and the use of locally extracted and manufactured materials contribute to an environmentally responsible and a resource-efficient approach. The fair faced concrete of the exterior requires minimal maintenance and has proven its durability in the harsh Icelandic climate. The cantilevered roof provides shading in the restaurant from the high summer sun while the panoramic windows offer natural heating from the low winter sun.